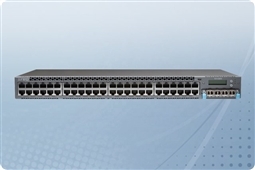 The Juniper Networks EX4300 Ethernet Switch Series combines the best of both worlds: carrier-class reliability and high availability of modular systems and the flexible economics and low power and cooling requirements of stackable platforms to deliver a high-performing, highly-scalable solution for campus, data center, branch office environments, and GbE access switch deployment. Offering a full suite of Layer 2 and Layer 3 switching capabilities, these fixed configuration switches include a number of high availability features typically associated with chassis-based solutions, including hot-swappable fans, modular Juniper Networks Junos operating system, dual routing engines with graceful Routing Engine switchover, single management interface, easy, centralized software upgrades, and scalability from 24 to 480 10/100/1000BASE-T ports, with up to 40 10GbE uplinks and 40 40GbE uplinks. 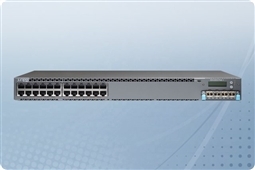 Four 40GbE ports are included standard, with the option to add 10GbE/1GbE modules for additional expansion.